I think any strong player knows that g2's purpose is to get sente - you make this exchange and then play away (or you just descend in gote to c2). No pro, and I think no strong amateur, would add e2 immediately. It reduces the aji of the g2 stone (mainly related to d5) and white doesn't really have a good way of saving his 2 stones - he may save them in sente (probably) by just connecting, but that would leave the aji from before. At first, observing the game and rooting for my team, I was happy to see this "sign of weakness", but thinking about this kind of move now, it really feels like a bot-decision when assessing good chances for himself and not caring for some bad exchanges. As Stanislaw skipped this move in his review, I felt obliged to add this comment. Well now I feel ashamed because always did make that exchange And I am 5d. Just looked at the joseki and indeed black does not play that atari.. I'm sure that many other josekis you know much better than most. Still I'd like an answer from you, as it's interesting to know if really some people were taught that that's the way to play the joseki. Anyway - I tried checking the position with Leela, and it does seem to like this move as well. I might play the e2 atari if I were playing that game. I am aware it's usually not played, but my thinking would be thus. First I don't like that white might play d2, is this sente? Probably not as jumping into the corner and an extension around c7 are kindo miai, but still I don't like white getting either of those in sente to hassle my group. But playing e2 means if he later d2 then c2 is sente atari. Yay, corner safe, a downside is compared to gote block at c2 the endgame is worse, but sente more important. The other downside (apart from lost ko threat) is the g5 wedge loses power. But is that relevant in this game? I think not as I'm unlikely to want to invade the lower side once white has jumped at o6. True it's a 2 point jump so thin, but also r3 is 2 spaces from o3 so m3 doesn't have a clear threat to connect. Maybe I might reduce from the n6 direction in which case a invasion might develop if white aggressively caps and then g5 and the h4 cut after gives some counterattacking potential but that seems too many ifs. If I think I'm leading then kesh the aji and make sure c2 is sente is plausible. Stanislaw highlighted several instances of Leela liking moves Carlo didn't play and vice versa: here's one I found interesting. After whites o14 attachment (which seems quite a desperate "let's make a mess" and chance to catch up move) Carlo carried out the threat of t14 with the s12 atari and then capture. Leela likes s12 but not capture and wants to answer o14. So why play s12 and not capture, schizophrenic bot foibles? I think not. If black directly answers o14 with natural moves whites plan could be o14, o15, p15, p14, q14, o13, r15, q13, s16. However with the s12 s11 exchange made this sequence doesn't work as black takes 2 stones at the end. That Leela saw this but Carlo didn't suggests to me Carlo was the one playing. Of course it's possible he was using Leela and chose to ignore this suggestion, but if this is your proposition you need better evidence to convict. s12 and then capture is very natural to a human. If we can get move timing information from the game record and see those moves in quick succession that's more evidence for not using Leela. - t14 hanes took 5 seconds. - s12 cut (deciding to ignore o14 attachment) took 15 seconds. - t13 capture took 11 seconds. They both played pretty fast: about half an hour each at this point. And a diagram for possible white plan. No good if marked stones already played. although in chess a 98 percent agreement between an engine and a player would be considered very strong evidence (even the best chess players in the world who train with computers all the time don't score nearly as high). When you talk of agreement with a chess engine do you mean playing the top choice of the engine, playing one of the top 3 choices of the engine (as in this case), or some more complex comparison. I am concerned that by choosing the broader top 3 metric a headline figure of 98% can be quoted (without telling people the typical distribution of non-cheaters) which suggests more guilt to the casual reader than warranted. When comparing to Leela's top choice I got 72% agreement*. * It may be even lower if you allow Leela to analyse more deeply. Leela starts off analysing moves suggested by its policy network, which has been trained on strong human games, so has a very human-like style (unlike -Zero bots). As it analyses more it may come to prefer moves which the policy network didn't like; AlphaGo's move 37 5th line shoulder hit being a famous example. To give an example from this game : in my first analysis for move 51 l17 was Leela's #1 choice and this is what Carlo played. It is also quite likely what I would play. But if I let Leela analyse for longer l17 becomes the #2 choice and e11 becomes #1. This may well happen with other moves too, so a deeper Leela analysis could see this similarity metric of 72% drop even further. P.S Another data point: a 1 kyu on reddit got 64% similarity to Leela's top 3 over moves 1-150 of his correspondence game; would be lower over same 50-150 interval as more similarity in opening. Chart: https://i.imgur.com/jMM4EIM.png. Unsurprising that a 1k isn't as good / similar to Leela at middle game than mid dans. They have got lots of games of dan players. Just run a check for the past games and you got a baseline. You can determine how similar an average dan x player plays to a specific engine. But it is not too difficult. If you are cheating you can do it in a few ways, I'd suggest 6 for starters. * copy every 1st choice move the AI pops up. * use the AI's suggestions in difficult situations. * use the AI's suggestions when they suggest a big shift in winning %. * use the AI's suggestions for a time when you fall behind. * use the AI's suggestions when you have no idea how to proceed. * simply observe the AI's suggestions before moving, but decide what to play by yourself. You can also use multiple AI, which may complicate things further. Which can be detected easily? Which can be detected with enough data? The investigation took about 5 months, I imagine they looked at this kind of stuff already. I wonder what they found. I'd want to see performance ratings in online tournaments vs offline tournaments for any suspect. A damn funky mother of a readout showing the goodness of each move during the games would also be mandatory for a top rate detective analysis script. 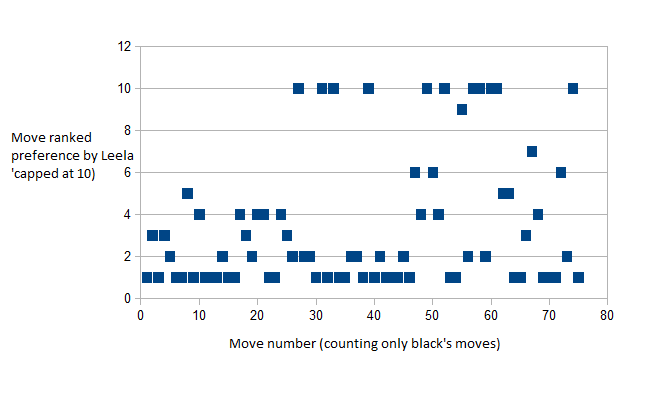 I think close comparisons with chess are unlikely to be that useful here: there are too many differences (e.g., in chess the average game has much fewer moves, which shorter length is often truncated even more by deep opening theory; there are generally fewer reasonable candidate moves; there are generally more forced moves, etc.). A 98 percent match rate in chess might only allow one nonmatch out of an entire game; it might happen occasionally in games between top chess pros but I suspect it would be rare. I don't have any firm opinion whether there was any cheating in this particular go game. But surely it is evident that a 64 percent match rate has 18 times as many nonmatches as a 98 percent match rate. That's a rather substantial difference. of 98 percent top three moves is extremely high. The Go board is too big, mid-dans are quite good amateurs but will play many suboptimal moves every game, and there is no obvious reason why their suboptimal moves should match or even be members of the same small set 98 percent of the time. There are probably also many moves per game on which there are multiple optimal moves (or so nearly optimal as to make no difference to a human player); there is no obvious reason these moves should have a near perfect match rate either. I am a similar level at chess as a mid-dan or even a bit higher, and if you analyzed all of the games I have played in my life with a top engine, I would be surprised if more than a few of them matched the engines top three moves 98 percent of the time, and would not surprised if none of them had such a high match rate. And rough logic suggests to me that the match rate should (a) be lower in Go than in chess; and (b) be lower with a weaker engine than a stronger one. The above is not a serious analysis, just my gut reaction. But yes, a 98 percent top three match rate seems very, very high to me. Higher because a go game can have many (for high dan) obvious moves. - I agree that as chess and go are different games with different number of reasonable moves etc the exact metric will be different. But what would be useful is how much of an outlier from typical values is strong enough to declare cheating. So if chess players of your level typically match bots 50-70% then 98% is very unusual. - Leela 0.11 is not superhuman like stockfish or AlphaGo, I think it's about 5-6d amateur so close to the humans in question. - 64% is a poor baseline to compare with, the 80 and 88% from my game is better as similar level. Even better would be players who have studied with Leela. A 4-5d on the UK team is such a player, I plan to check one of his games when I have time. - The denominator of these percentages is 50, so we are talking 49 out of 50 top 3 matches meaning cheating versus 44 out of 50 being innocent. Are there fewer obvious moves for top chess players? I suppose in go, you often choose one sequence over the other. Is it more like choosing specific moves in chess? As I mentioned before, matching is confirmatory evidence, and confirmatory evidence is weak. The principal statistical question is whether Carlos's play differed from his normal, non-cheating play. Note that differing from his normal play does not mean that he was cheating. One way of cheating is to choose one of Leela's top three plays for several moves, so matching addresses the question of how he cheated, if he did, which is a different question from whether he cheated. As Uberdude pointed out, he might have cheated, if he did, by copying Zen, with similar results. As hyperpape pointed out in post #11 ( viewtopic.php?p=228848#p228848 ) Regan's work on cheating in chess is relevant. Regan's statistical approach asks how much better a player played than usual, not about similarity to the play of any specific engine, and typically requires non-statistical evidence of cheating, which may be supported by the statistical evidence. Only in very rare cases does Regan consider the statistical evidence good enough by itself to indicate cheating. Note that the discussions here about specific plays and how good or bad they may be are about non-statistical evidence, and are appropriate to the question of whether cheating occurred. I was actively playing chess online during the period when commercially-available engines got really strong, and this experience has made me very cynical. Many people are honest and would never consider using an engine to cheat. But a surprising number of people will cheat if they think they can get away with it. Some will cheat stupidly and get caught very easily; others will cheat intelligently and perhaps never be caught. Some amateurs will cheat; so will some professionals. From a Bayesian point of view, Bartleby's observations are pertinent to the question of cheating in this case, or any other case of cheating at go, as they inform prior beliefs about the possibility and probability of cheating. Well, the match rate does not mean much, anyway. Confirmatory evidence is weak, weak, weak. Openings in chess and joseki in go allow players to make plays at a high level simply by knowing them. And in the late endgame, even if good players may not choose exactly the same play at any point, plays which match the actual win rate are extremely common. By contrast, in chess the endgame can be extremely difficult, with even top players missing wins. In go it is the middle game where the weaknesses of strong amateurs are likely to show up. My impression is that in go there are more likely to be long sequences of play where there is little choice, because the plays are not independent. There is more chunking in go. It seems to me that combinations of the same length are likely to be conceptually richer in chess. For instance, in go the one lane road is fairly common. I don't think that is the case in chess. Simply counting matches of individual plays in go does not take into account the dependence of plays upon each other, which is quite common in go. Once a certain play is chosen, several followups may become obvious. That's another reason that you can't just count plays that match, or even plays that are good or bad. I remember seeing a 41 move variation (21 chess moves long) in a game commentary, but the author (Kitani, IIRC) said that even amateurs could read it out, because it was a one lane road. Would that 21 move match be evidence of cheating? A 4-5d on the UK team is such a player, I plan to check one of his games when I have time. Well since he did play Carlo in the final game of last year, it might be amusing. I'm afraid I don 't have any hard statistics for you regarding top three chess moves, just impressions. Are you saying that the fact that Leela is weaker makes matching more likely? I would think the opposite is true. There are generally more suboptimal moves in any given position than optimal moves, so I suspect that match rate should be lower with weaker engines, not higher. It would be interesting to know the match rste of the other plsyer who has trained with Leela, and if that match rate is higher than an equally strong player who hasn't with Leela. I still think 98 percent is really high. Although confirmatory evidence may be weak in general, at some point that becomes no longer true. If a player had a 100 percent match rate over an entire game would this not be highly suspect? 98 per cent is quite close to 100 per cent. But my main point is not about this game in particular, or even match rates in general. It's rather that in a competitive game like chess or Go, and especially when playing over the Internet when a cheater can always rely on plausible deniability, cheating is likely to become a real problem as stronger and stronger engines become available. Maybe the problem will be less in Go than in chess: my general impression is that there is a significantly higher percentage of dysfunctional personalities among chess players than Go players. My general impression is that there is a significantly higher percentage of dysfunctional personalities among chess players than Go players. For sure in the Winter Games. You find an agreement of 49/50 to be strong evidence of cheating. How about 11/12? Of those 50 moves, there are blindingly obvious ones, such as replying to a threat to kill several stones. Also, as I have indicated, there are sequences of play which form a unit, because once you have made the first play you are going to make the others. The relationship is tighter than that of most chess combinations, because as a rule the sequence forms a chunk, or single idea. The fifty moves in question are Black 51 - Black 149. Black 51 is not obvious, but it starts a 4 move chunk -- or maybe two 2 move chunks, depending upon how you make the call. In any event, the four moves are not independent. Soon thereafter there is a 7 move chunk, or perhaps a 5 move chunk followed by two obvious moves, it comes to the same thing. Then there is a move that a lot of players of Carlos's strength would choose, but it's not obvious. Then there is an obvious play, followed by a 5 move chunk. Not long after there is another 5 move sequence, which I would call two chunks, but if you play the first one you are going to play the second one, so together they form a unit. There are a few more long sequences that form units. Ignoring obvious plays that are not part of a unit, I come up with 12 units of play (including one move units) in those 50 moves. I assume that one of the units does not match Leela's top three choices. OC, other people may see things somewhat differently, but Black made rather fewer independent non-obvious decisions than 50.